Last edited by I-fly-any-and-all; 07-10-2018 at 12:55 PM. I'll see what I can do. I'll be out of town for the rest of the month. It's been down there so long it may be dry rotted! I have a complete Royal Bleriot in the box. appowner what size royal bleriot the 52 inch or 46 and 1/16th? It's the 52 inch or 1/6 scale. Very disappointed to the scale fidelity of the bed frame landing gear. Which is why I haven't built it, among other reasons. Mick Reeves does one in various sizes that is much better. Hello guys i tryed and tryed to find some build log about this wonderful kit but unfortunally i didnt find nothing..well only a short video about a Greek guy in youtube..
To be honest it's not a easy build for me, the plans no indicate tupe of wood and i had I had difficulty interpreting and cut some pieces..anyway thanks for the big help from my friend Lelio and his precius CNC the works are in progress! here you can see photos..
Nice Stinson! You did a beautiful job! I love the blue and silver paint scheme! Davide72 if i understand your question correctly you are looking for a build log of the royal stinson reliant? A guy on ebay is selling short kits. okay, I am now. And i’m the author of the thread lol! Them’s was the good old days when we all obsessively posted on this blessed space.. I don't feel amazing and I am 2 yrs older than Ron M. but I am still flying regularly. Sid, you might remember me. I somehow had communicated with you online and it turned out you lived only a few blocks away! You picked me up in your van outfited to haul models and we flew at Cherry Creek res. club. You had a yellow Shoestring and I flew my Sig Kavalier. It was pretty windy! I hope you’re well and still flying! I'm still around. There's a nice Corsair listed on RCU with cockpit, engine kit . . . and free shipping. Side tracked with other projects but still have the P-38 rebuild. Cool what all does your P38 rebuild entail? 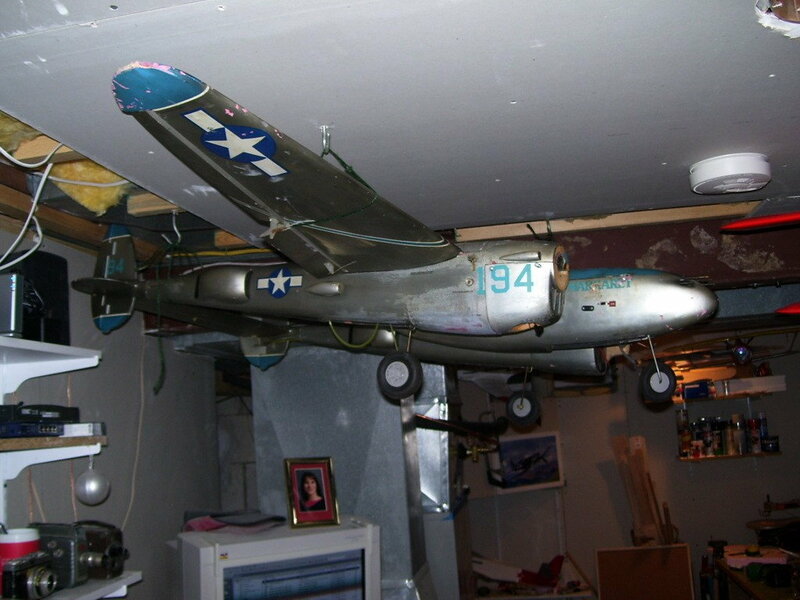 I picked up a P-38 that had been hanging in a bar for some twenty years. I've stripped most of it down and gutted the old gear. There are still a few pieces of balsa that need replacing. It's been filled with who-knows-what filler and primed and painted. I planned on attempting to cover but doing a test of the tail proved that even with "most" of the paint off, to a smooth-ish finish, the covering still bubbles. So, I'll likely end up painting, but with today's primer and paint, so it shouldn't take as much, hopefully. I also picked up replacement engine cowls to reduce weight and will be looking for replacement retracts. I've swapped out the original servos with current technology and hid the tail servos behind the coolers (meaning you can remove the housing and have access to the servos). We'll see if this was a bad idea once I get the motors and batteries installed to check the CG. Yes, I plan on running outrunners. Once I get it closer, I'll figure out if I need 5 or 6 cells/motor.